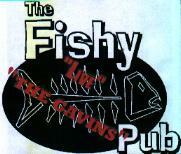 "Live at Fishy Pub - The Gavins"
Recorded at the Fishy Pub, New Years Eve 1998. Recorded & Produced by, Umm I forget, Legends Digital Recording Studio and Gavin. Mastered by nobody. What's Mastering? Released in 1999, well at least given to guests at the pub without any prior permission from the band. 0 copies sold, a hand full given away. Recorded on a digital 4 Track set up in one of the pubs motel rooms, the "Live at Fishy Pub" recording was organised as a ploy to attract punters to the Fishy Pub on New Years Eve - Nothing excites a drunk more than knowing he is going to be recorded live, screaming his drunk arse off in the back ground of a rock bands recording, in front of a bunch of other drunken bafoons. Gavin were still known as a "covers" band back then, and could ony play one set of original songs if they would agree to compliment these with two full sets of classic "covers". The vocal track was re-recorded (quite badly I might add) on some guys Amiga 500 computer at a Fish Creek Farm. 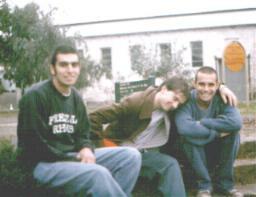 It is the only known recording of a lot of the older "The Gavins" material. G-K, Bubblegum and Silver Heart would never be heard on CD again.. The track "Super Dog and the Vanishing ice-cream truck" was originally titled "Mr. Butterfly" and an early two track recording was entered into the first Melbourne Triple J Unearthed. Not suprisingly, the track didn't win. Andy and the Fishy Pub knew when they were on to a good thing, so rather than just let the infamous live recording of Gavin get chucked on the trash heap, they couldn't resist but to get more local bands to try their luck on digital 4 track. 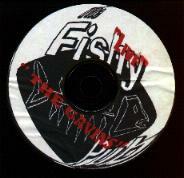 Amongst any proud Fish Creekster's cd collection, you will find more classic "Live at Fishy Pub" performances from acts such as That band of Marty's" and "Those other guys from the "Fishy Pub".... Of course, none will be forgotten so fondly, as that of "The Gavins".... or was it "Gavin" ??? The Gavins, The Gavin, or Gavin???? 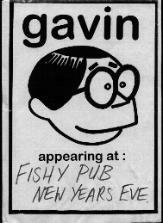 Being a bunch of immature little school kids, not only did the band members give themselves the ridiculous title of "The Gavins", they also found it neccessary to change the name well before the time of the Fishy Pub recording to just "Gavin". And although they had already released their first cassette EP under the name "Gavin", this name change caused great confusion among the music industry and great torment for the band itself. They were being advertised as "The Gavins", when they had specifically told the venues, the name's just "Gavin" buddy! The name change was supposed to be the beginning of the groups metamorphosis, the progression to a band that would only play original material!! In a radio interview to flog off some of the first EP's, Peter Galati made it quite clear that the band was called "Gavin", but to no avail - "OK, this next track is by "The Gavin..." Ahhhhhhhhh!! Not knowing who they were, the members of "That Gavins Band" got caught in a downward spiral of schoolwork, retail management training and the stinky profession of buggery Butchery. After much verbal abuse to their friends, fans, colleagues and peers, eventually the band name "Gavin" stuck, and even the beloved host of Inverloch's notorious community radio station 3mfm ceased calling "Gavin" - "The Gavin". foldout from "Live at Fishy Pub...."
Thanks goes out to our graphic designers..